But there exist an easier method without any additional data file. In Fig. 1 three points with different symbols are plotted. We use the possibility to tell Gnuplot with the '-' input to read from standard input. Here we tell Gnuplot to do this three times. After the plot command the data is entered. Every single data entry have to ended with the e line. In the last entry we had mean and standard variation data for five different conditions. Now let us assume that we have only two different conditions, but have measured with three different instruments A, B and C. We have used a ANOVA to verify that the data for the two conditions are significant different. As a result the plot in Fig. 1 should be created. Now every instrument is stored in a different data block containing both conditions as columns. The color definitions and axes settings are done in a similar way as in the previous blog entry. Note that we have to define two more colors for the boxes, because we use three different colors. Also we define a black line to plot the significance indicator (arrow). 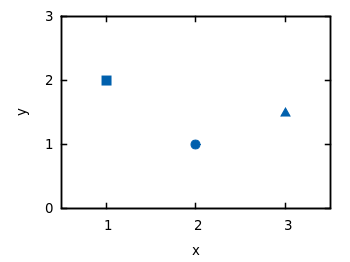 For the plot the index command is used to plot first condition A, then B and then C by using block 0,1, and 2 respectively. The x-position of the boxes for instrument A are slightly shifted to the left, the ones for C to the right by subtracting or adding the value of bs. The value of bs has the width of one box in order to plot the boxes side by side. If we have done a experiment in order to apply a significance test like a ANOVA to our measured data, we are interested in presenting our statistical data in a familiar way. The results for the last two conditions are significant different from the first ones. Using this data we want to create a plot that looks like the one in Fig. 1. 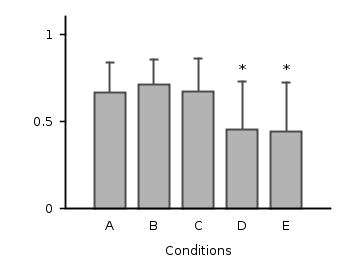 For the first line style which is used to plot the errorbars also a point size of 0 is specified in order to plot only the errorbars and no points on top of the boxes. The *-dots above the two last conditions to indicate their significant difference are just added as labels. 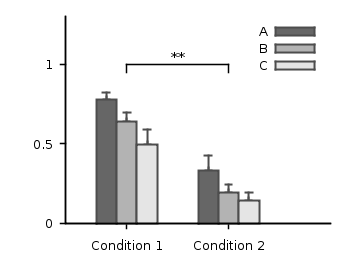 The border of the graph on the top and right side is removed by set border 3 (see here for an explanation of the number codes) and by using the nomirror option for the tics. The xtics are not visible, because we set them to scale 0. 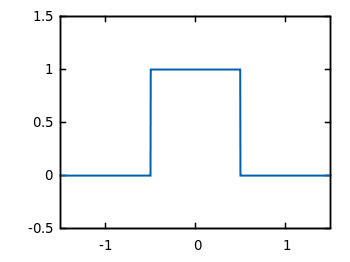 In Gnuplot it is easy to define a continuous and differentiable function such as f(x) = x, but what to do if we need a function that fulfill non of these conditions? Which is a simple if-else statement and means step(x)=1 if x>a else step(x)=0. If we plot this function we get Fig. 1. As you can see this will result in a continuous plot. 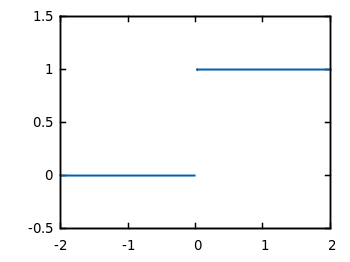 If we want a discontinuity in the plot, we have to create two separate functions that are only piecewise defined. This can be achieved by using 1/0 that will result in a undefined value. Plotting both functions will result in Fig. 2. In Fig. 3 you can see a plot of this function. To produce the sharp edges of the rectangular function we use a higher number of sampling points (also in Fig. 1 for the step function). 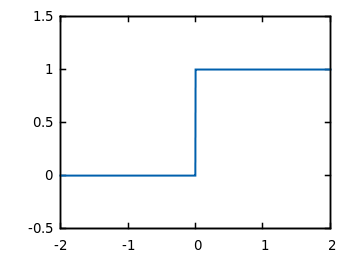 In order to plot a function Gnuplot calculates 100 points of the given function and draw a line through them. This can be set to another value with the set samples <value> command. It can happen that some features of Gnuplot (for me the readline stuff) do not work as expected. If you experience problems, then you have to compile gnuplot yourself, which is in most cases straight forward. You can download it from sourceforge. 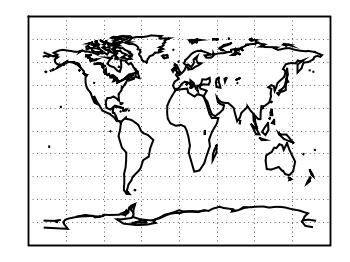 Here you can see a problem of the svg terminal of Gnuplot: it can’t produce dashed lines. In order to fix this, we can use Inkscape and open the svg file. Then pressing CRTL+F and type gray into the Style field and hit Enter. Now all the grid lines should be selected and you can set their stroke style to dashed by typing CRTL+Shift+F and choose one under Dashes. Doing so will lead to a figure shown in Fig. 2. We can also easily draw a whole globe in 3D from the given data. Therefore we first add a gray line style, unset the border and arrange the figure margins. offset between the lowest z vlaue an the xy-plane. 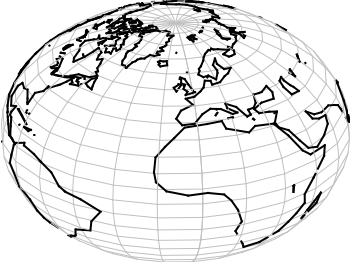 To have Europe in the center we set also the viewport. As you can see we have some problems with the data for Africa which lies behind the grid at some points. To avoid this and to make the grid dashed again we draw a grid with tinier radius and use Inkscape. to avoid that any line of the grid covered a black world line. Having done all that we will finally get the nice globe in Fig. 4. If you use the postscript terminal and have a greek letter e.g. Φ for the xlabel, it should be italic because it is a variable. This will finally generate our desired italic Φ.
Update: in the meantime I have learned Helvetica-Italic is not part of the official postscript core fonts. Hence, use also Helvetica-Oblique. If you have measurement data and like to plot them as points combined by lines, you will probably do that with the linespoints plotting style. But for some applications it is required to combine the data points by non-continuous lines to emphasize that the data came from measurements as shown in Fig. 1. In Gnuplot exists no line style that can do this directly. But with a little trick it is very easy to achieve. Since Gnuplot 4.4. there exists the property pointinterval (see the documentation) in combination with the plotting style linespoints. This property plots not every single point, but only every second for a value of 2 and so on. 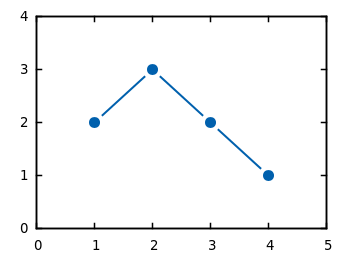 But if we use the value -1 it tells Gnuplot to insert a little gap between the points and the line. The size of the gap can be set by the pointintervalbox property. We specify a point interval pi of -1 and a point size of 1.5, in addition we set the the gap to a point size of 3. Now we can plot our data with the linespoints style. Using the same data as in the first plot of the gnuplot basics tutorial Plotting data we will get Fig. 1 as a result.